As it so often is with local legends, there are several versions of this tale. I have chosen to combine the story as I've heard it with a version collected by the Reverend RC Macleod, which was told to him by Mr. Neil MacLeod, the Clan Bard in the latter half of the Nineteenth Century. The lullaby at the end was obtained in the Gaelic, translated into English, and published it in The Gael in October 1878. The powerful Clan MacLeod ("Family of the Sons of Leod") held the Lordship of the Isles for many years, and has had its hereditary seat on the Isle of Skye for 800 years. 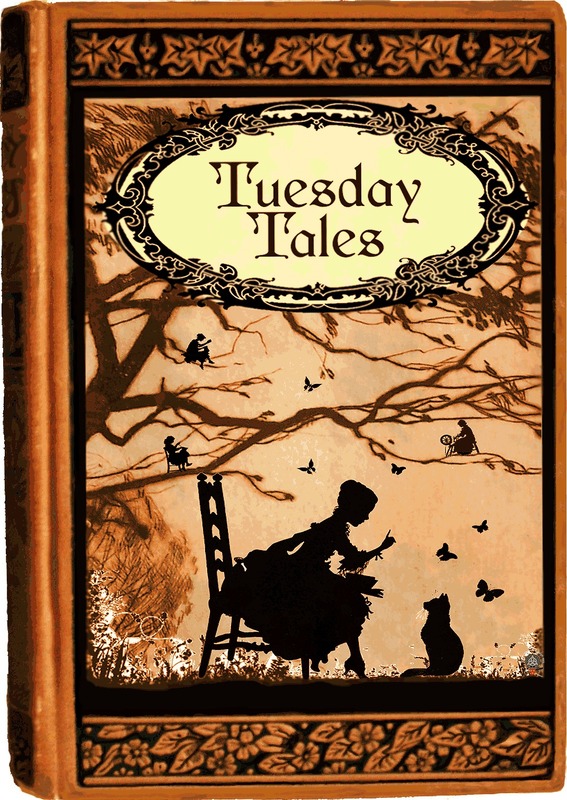 Their castle, Dunvegan Castle (the oldest continually-inhabited castle in Scotland), the Fairy Bridge, and the Fairy Flag, all mentioned in this Tuesday's Tale, still exist, and draw many visitors to the Isle of Skye each year. Once, long ago, there was a handsome young Chief of the Clan MacLeod who had come of the age to marry. He had never given his heart to anyone, although many young women hoped his eye would shine on them. It seemed that he might not find a partner to share his life with, until one day he met a mysterious young woman; he felt his heart stir the moment he set eyes on her. To his delight, the young beauty felt a similar warmth for him, and in no time, they developed a very strong affection for one another. They walked in the heathery fields together each day, marveling in the land, the sun on the water, and the things they saw in each others' eyes. The Chief soon grew bold, and one fine morning, knelt before her and asked the young woman to marry him. She grew quiet, then seemed to make up her mind, and asked him to sit down with her. The young maiden revealed to him that she was not a mortal woman, but a Faerie Princess, and as such, would have to ask her father, the King, for his permission before she could consent to marry him, as there were many rules that forbade it amongst her people. The Princess approached her father the Faerie King, and explained that she had fallen in love with a mortal, and that he had lovingly asked for her hand. The King saw the look in his daughter's eyes, and knew that she was fully in love with the mortal Clan Chief. He was not unsympathetic, but explained to her that he could not give his full consent to the union - for she was Faerie, an immortal, and would live forever, but her belovèd MacLeod would perish all too soon, leaving her to pine and grieve eternally for his loss. 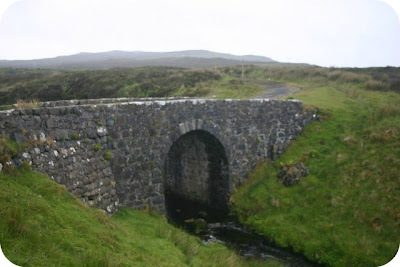 The Princess and MacLeod were distraught at the thought of parting so soon, and eventually, the King took pity on them, and consented to their union, but for only a short time - they would have a year and a day together, but then the Princess must cross the Faerie Bridge and return to her own people. The couple were wed, and spent a blissful year in Dunvegan Castle, towards the end of which, a son was born, making their happiness complete, although they knew that their time together was coming to an end. Exactly one year and a day later, the Faerie King and his retinue appeared at the far side of the Faerie Bridge. Chief MacLeod held her tightly as she wept, and they prepared to bid their farewells. As she got ready to leave, she bade MacLeod promise never to leave their child to cry, as the sound of his wailing would reach her in Faerie, and the anguish would be unbearable. The Chieftan gave his solemn word, as she walked towards her father and the rest of her people, waiting for her on the other side of the bridge. The Chieftain wept as she crossed, and faded from sight. Time passed and the Chieftain sank into an unbearable sadness. He played with his newborn son but his eyes were so alike to his mother's that the Chieftain had to look away, and felt his heart sinking at the loss of his true love, even though she had left him a son and heir. The Chieftain's court grew more concerned each day, as the Chieftain became more and more withdrawn and solemn. Finally, they decided that a great feast should be held in order to lift the Chieftain's spirits. His birthday was fast approaching, which seemed to them a good opportunity to call for a celebration. And so, the grieving MacLeod reluctantly gave his consent, and preparations were made for the great feast. Illustration: A photo of the Fairy Bridge, Dunvegan, Isle of Skye - courtesy Wikimedia Commons. At last, the day of the Chieftain's Birthday Party arrived, and people came from far and wide to take part in the festivities: Bards from the mainland and surrounding islands were in attendance, and good food and drink poured into the castle from all directions as guests and merchants came to pay homage to their Clan Chief. The party was of such grandeur and intensity that the Chieftain was soon caught-up in the festivities, and for the first time in a long while, could be seen smiling and engaging in the revels. The wee bairn (child) had been entrusted to the care of a nurse. Eventually, the sounds of the party reached the nursery, and the young maid grew curious as to what was happening in the great hall. She should have kept to her post, but the sound of the revelries downstairs were irresistible, and she left the room to watch the party from the top of the stairs for a while. While the nursemaid was away, the child became restless in his sleep and kicked off the blanket that had been covering him. He soon grew cold and uncomfortable, and began to cry. As the party was in full-swing, the nursemaid was unable to hear him. Soon his cries grew louder and louder, until they could be heard far and away, in the land of Faerie. The babe's mother, the Faerie Princess, heard his cries, and she set off, her heart breaking, to soothe her crying babe. When she appeared in the castle, she saw the party in full-swing and realised what must have happened. She comforted her baby with whispered words, and lay him down in his cradle, taking off her own silken shawl and wrapping it securely around him. And the Catanaich sowing the corn. Oh, let me not hear of thy being wounded. Ere the close of thy day. Descendant of a race more esteemed. Whose father's native land was Scandinavia. 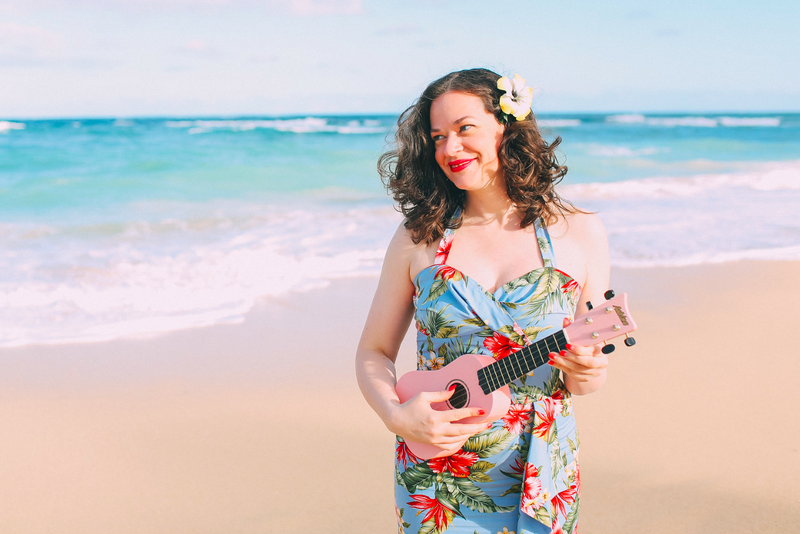 The nursemaid heard this song over the revelry, and returned to find the baby sleeping soundly but wrapped in a strange shawl, and she was perplexed. She confessed to the Chieftain that she had left the babe for a few minutes, but neither could solve the mystery of the intricate silken shawl. Some years later, when the child was older, he told his father that he remembered his mother's visit to him on the night of the birthday party, and repeated the words she had whispered to him so many years before: The shawl was a magical faerie flag, which could be used to protect the Clan MacLeod in times of great peril. Should the Clan be in danger, the flag was to be taken out and waved three times, and the danger would pass. But the flag could only be used three times, after which, the magic would no longer work. It is said that the Faerie Flag has been used twice to this day - once when the Clan MacLeod was outnumbered by the Clan Donald. The Chieftain knew he faced certain death, so he had the flag brought out and waved thrice. No sooner had he done this than the ranks of his army were swelled by hundreds of Faerie Folk, and the Donalds took flight in fear. The second time it was used when all the cattle in the MacLeod lands had fallen ill and were dying; the Clan faced starvation over the winter without milk and meat. The flag was again brought out and brandished thrice, and the Faerie Host descended upon the lands and healed all the ailing beasts. Several members of the Clan MacLeod carried photographic images of the Faerie Flag with them into war during the Battle of Britain. Many British pilots were lost but none of the MacLeods lost their lives. Many would dismiss the legend of the Faerie Flag, calling it a hoax, or a relic of the crusades, around which a fanciful tale has been woven. Regardless, the Faerie Flag of Dunvegan Castle is lovingly preserved, ensuring the continued good fortune and preservation of the proud Clan MacLeod. 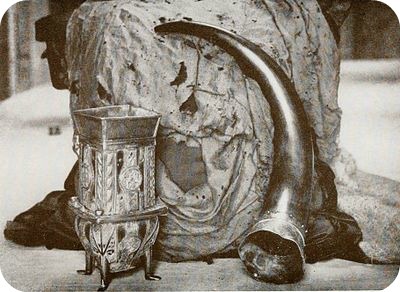 Illustration: A photo of the Dunvegan Cup, Fairy Flag, and Rory Mor's Horn from MacLeod, C. 1927. The Macleods of Dunvegan from the time of Leod to the End of the Seventeenth Century. pp. 38-39. Edinburgh: The Clan MacLeod Society. Main source for this tale: MacLeod, R. C. (1927). The MacLeods of Dunvegan from the time of Leod to the end of the seventeenth century. Edinburgh: Priv. Print. for the Clan MacLeod Society. There is more information on the Faerie Flag of Dunvegan here. Love this one :) I am always fascinated by the fae stories! Maybe this is why some of the MacLeod clan turned into immortal highlanders :P Seriously though, I am thoroughly enjoying this series! Oh!I love the idea of a protective faerie flag.I will haveto tap my inner faerie and make one I think.A great story...again! Thank you! That's a great idea. One of the projects we've been discussing for our new flat is a hand-sewn banner, with prayers stitched in. Creating a special protective object or article of clothing is something very powerful, and is still practiced in many societies, including here in the British Isles: Many of the fisherman's jumpers here were traditionally woven by family members who would pray for the seaman's safety whilst weaving, and prayer shawls seem to be making a comeback as gifts for friends facing adversity. My grandma used to stitch a protective symbol into the clothes she gave me. I think it's a good practice to focus intention and the power of prayer, imbuing a handmade sewing project with good thoughts and energy. I hope you'll post about it when you're done! I really appreciate how receptive Debi's readers have been. I'm glad you're enjoying the series. I had not heard this tale before and really enjoyed it. How sad that the princess had to leave her child behind. I like the idea of the Battle of Britain pilots taking the pictures of the flag when they flew. Yes, it is sad. I'd wondered about the Faerie King's decision when I remembered that time in Faerie passes at a much different rate than in our world. If the Princess had come to live with her husband, she would have experienced a human lifetime with him, watched him (and her son) grow old and wither, and yet she would remain, and bear the burden of that grief. The Faerie King, wanting to lessen that burden, decided to give her but a taste of a mortal life, but not enough to develop the deeper roots of attachment that grow over time. Both fates are cruel but the King's decision was perhaps to a lesser degree. I thought the bit about the WWII pilots carrying the image of the Faerie Flag as a talisman was great. It is really only very recently that Faerie beliefs have left these islands. There are bits of it left in the rural areas. A century ago, when W.Y. 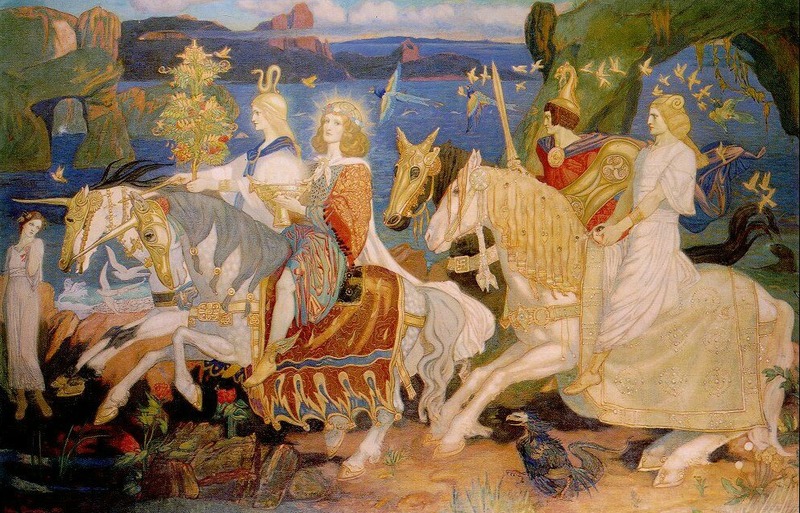 Evans Wentz collected Faerie stories in Gaelic, the belief was very strong. Thanks for letting me know more about the Faerie beliefs. I suppose it was less cruel for her to not have to watch them age and die, I too forgot time is different in the Faerie world. Being a Tolkien geek, I think of Arwen, and the story of her torment at the end of Aragorn's life. It would be a cruel parting, as in Tolkien's mythos, Elves must wait in the Hall of Manos for the End of Days, while only Eru Ilúvatar (the Supreme Being) knows the fate of humans, which is separate from all other beings in the Circles of the World. J.R.R. Tolkien drew heavily from Celtic Myth and Faerie beliefs, as well as Norse Mythology (which also has a wealth of Faerie stories).